There’s now a F.L.O.W. volunteer to help you sign up for a library card, check out books, or answer any questions, almost every day of the week! Check the WCCW calendar for hours and more details. Since we started in July 2014, we’ve received over 6000 donations of books, DVDs, CDs, and zines. Around 1500 items are currently checked out to more than 1500 card holders based all over the world. We’ve attended 70 events, from Riverside to Loyola Marymount to Long Beach to Whittier to Pasadena to West Hollywood to Echo Park to Little Tokyo. It’s National Novel Writing Month! We’ve got a few books by Natalie Goldberg on our shelves to help you get inspired, like Writing Down the Bones: Freeing the Writer Within and The Great Spring: Writing, Zen, and This Zigzag Life. Or you might want to check out a memoir like Sara Paretsky’s Writing in an Age of Silence, which reflects on what it means to be a writer in post-9/11 America. For a deep historical dive, there’s Jonathan Goldberg’s Desiring Women Writing: English Renaissance Examples, which explores what it meant for women to take up writing in 16th and 17th-century England. Of course we also have a gigantic bookcase filled with amazing novels to peruse, among them: The Mare, by Mary Gaitskill (b. November 11, 1954), deals with a young girl and her horse and her complicated family; Alias Grace, by Margaret Atwood (b. November 18, 1939) is a novel of historical fiction about nineteenth-century Irish-Canadian maid Grace Marks, convicted of murdering her boss and his mistress; Burger’s Daughter, by Nadine Gordimer (b. November 20, 1923) is a political novel about white anti-apartheid activism in South Africa, banned there on its publication in 1979; or In Her Day, the second novel by Lavender Menace and Furies collective member Rita Mae Brown (b. November 28, 1944), which chronicles a lesbian feminist romance in 1970s Greenwich Village. 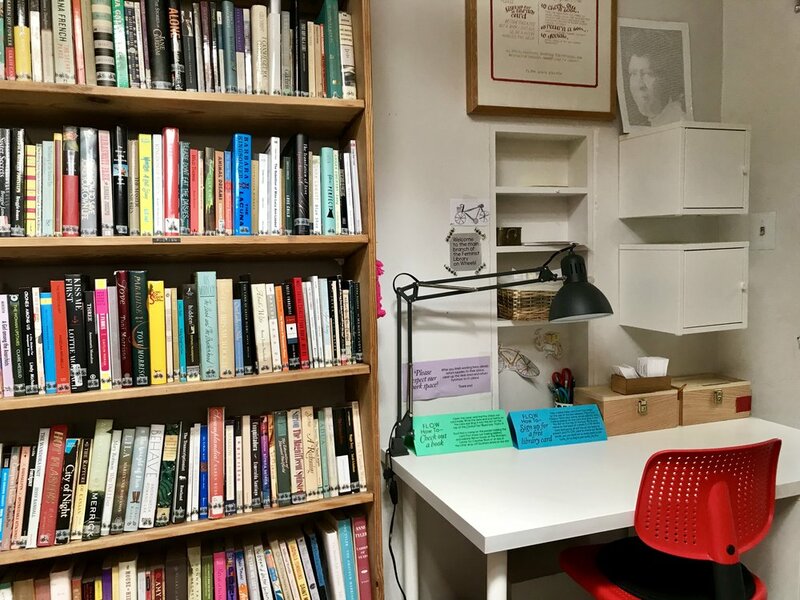 If you’re interested in conversations about organizing and mutual aid like the ones the new Human Resources for Art Workers group are having this quarter, you might want to browse our work/labor section (located in the main space of the WCCW, near the big grey chair). There you’ll find histories like Philip S. Foner’s Women and the American Labor Movement, Diane Balser’s Sisterhood and Solidarity: Feminism and Labor in Modern Times, Patricia Zavella’s Women’s Work & Chicano Families: Cannery Workers of the Santa Clarita Valley, and Barbara Wertheimer’s We Were There: The story of working women in America. Other fascinating volumes on those shelves include Household Workers Unite: The Untold Story of African American Women Who Built a Movement, by Premilla Nadasen, Song of the Stubborn One Thousand: The Watsonville Canning Strike 1985-87, by Peter Shapiro, and Andrea Komlosy’s brand new opus, Work: The Last 1,000 Years.